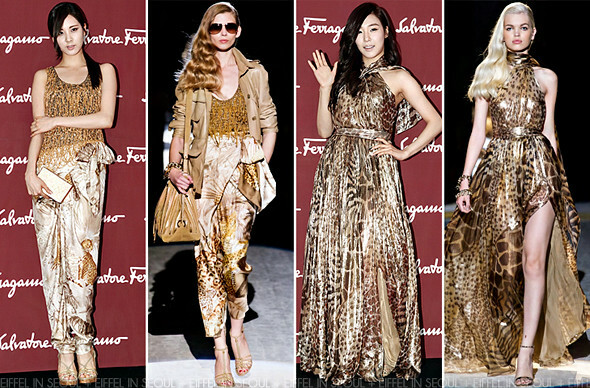 Salvatore Ferragamo held its Cheongdam flagship store reopening party and jewelry launch on July 5, 2012 in Seoul, South Korea. The event attracted female stars like Girls' Generation, Kim Min Jung (김민정) and Han Go Eun (한고은). Seohyun (서현) wore an embellished blouse with satin silk trousers from Salvatore Ferragamo Spring/Summer 2012 collection. Completing her look with a white clutch and wedges. This is rather disappointing after seeing her previous Salvatore Ferragamo outfit, I don't think she can top that. Kim Min Jung (김민정) was seen wearing the magenta dress which we have seen on celebrities like Lynn Hung (熊黛林), Ann Kok (郭舒贤), Tiffany (티파니). Her black safety shorts bothers me. Han Go Eun (한고은) wore a one-shoulder printed dress, styling her look with a white clutch and purple sandals from the same collection. I do wish she cover up her wound on her knee. Her legs are way too thin. i disagree. i prefer seohyun outfit here. her skin look brighter with those gold jumper compared to the floral printed one.